Its been almost a week that I wrote any new post..nopes! it was not due to my pathetic broadband connection but the weather. The shivering cold at my place got my hands badly swollen and I'm uncomfortable typing due to itching on my fingers :'( Still I managed to start writing today because I am excited to review a brand that I'm loving these days.... I am talking about Puresense by Soap Opera. 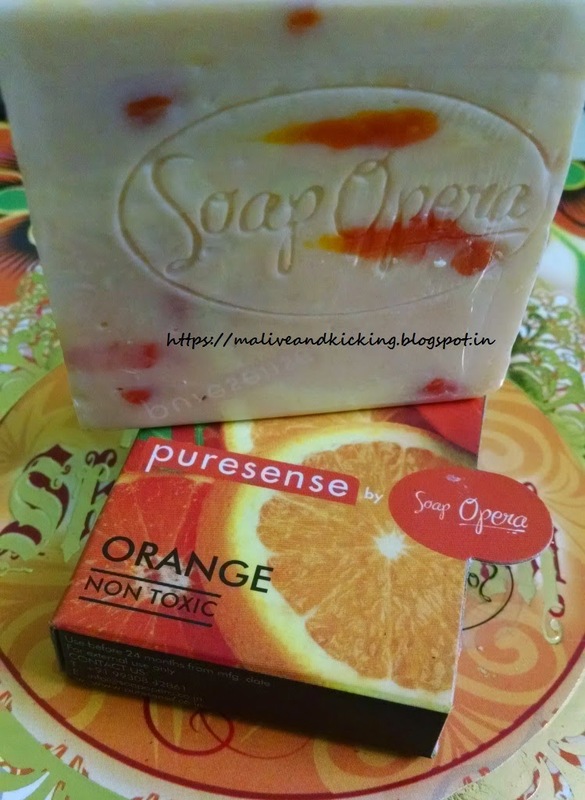 Puresense is a brand by Soap Opera that has been created on the philosophy of living a life free of toxins. To achieve this objective, Puresense created a wide range of premium quality personal care products which were essentially non-carcinogenic, free from Parabens, formaldehydes and sulphates. Fruit Soaps in Orange, Cucumber, Royal Apple, Strawberry variants. Floral Soaps in Rose, lavender, Madhumati, Frangipani variants. Spice Soaps in Green Tea, Cinnamon, Clove, Lemon Grass, Spearmint variants. Bodywashes in Green Tea, Lemon Grass, Spearmint variants. Shampoos in Green Tea, Lemon Grass, Spearmint variants. Bodymists in Vanilla Bloom, Lemony Fresh variants. 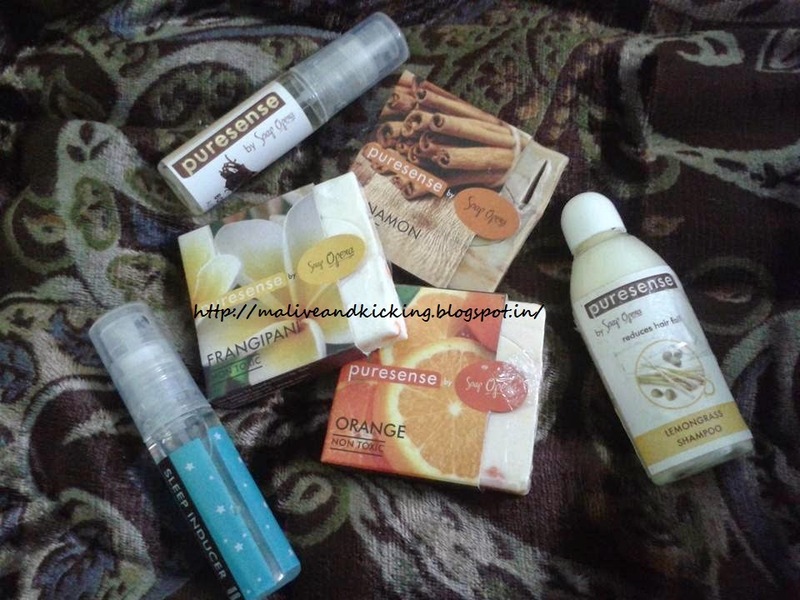 Out of the above non-toxic products, I received this lovely hamper of three soaps from different categories along with a bodymist, shampoo and sleep inducer as well. I received the cute n sleek sample pack of the soap which weighs 30g. But the usual soap bar is of 100 gms being sold at a price of Rs 99. I genuinely appreciate Puresense for giving complete detail of ingredients even on the SAMPLE soap packing unlike most brands which lack on this part. The soap is crafted with high percentage of Olive Oil along with Sodium Palmate, Sodium palm kernalate, Aqua, Sodium cocoyl Isetionate, Fragrance, Ethylene Hydroxydiphosphonate, Sorbitol, Titanium dioxide, Glyceryl stearate, Disodium distyrylbiphenyl disulfonate. These scientific names of the ingredients might confuse you, but actually these are beneficial essential oils extracted from nature. 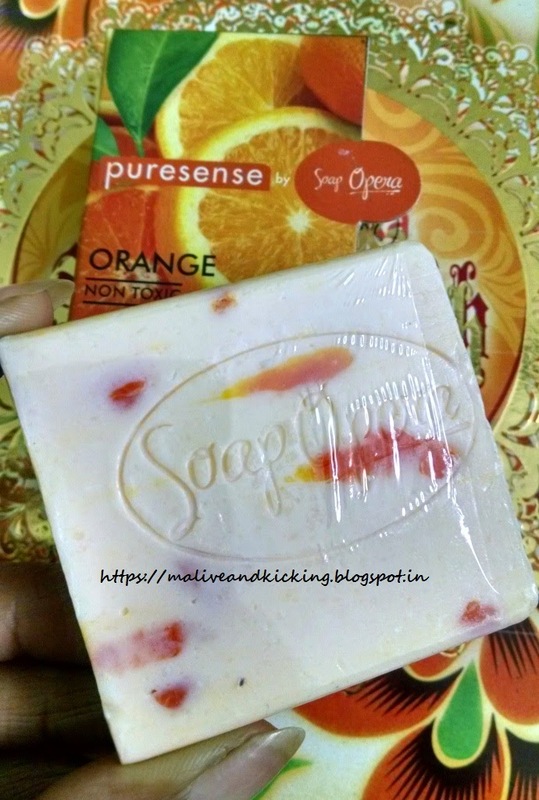 Talking about the impressive packaging, I loved the way how Puresense wraps the soap bar in thin transparent cling film which peeps out from an external cardboard pack :) An oval sticker bearing the brand name 'Soap Opera' keeps holding the soap bar without letting it slip out from pack. My Experience: As soon as I unwrapped the packaging, I could not stop smiling at the decently simple square piece of soap bar that looked edible slice of dessert because of orangy chunks in it. The soap also is embossed with the brand name 'Soap Opera' on it. The soap smells somewhat sweet n tangy to me which doesn't causes irritation in my nose. The soap lathers gently enough when rubbed between palms with water. My skin felt thoroughly cleansed as well as hydrated the dried skin post shower. The mild fragrance could be experienced for quite some time, but doesn't last very long. People who like short-termed perfumes on their body would love this specially. The richness of Olive Oil provides softness n moisture as it is kind to the skin. The powdered orange peel used to be my favourite home remedy to gain fresh n supple skin years back. 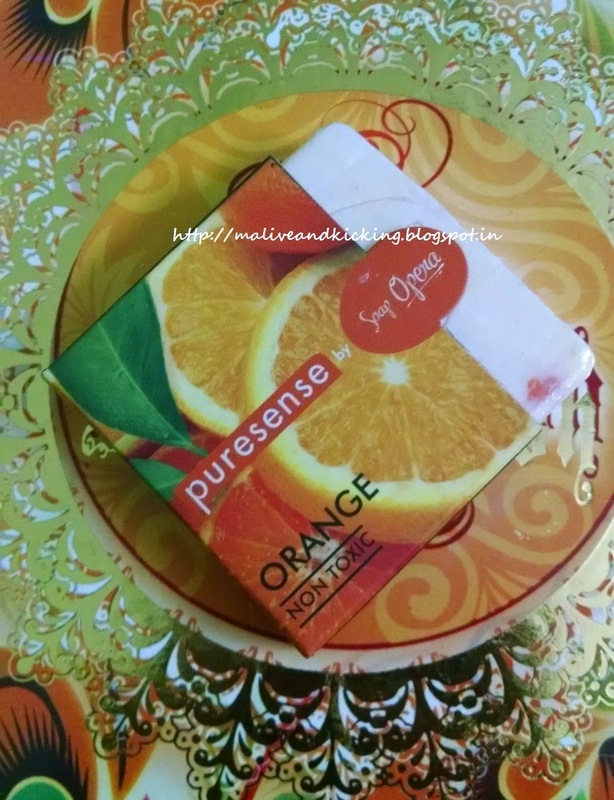 I can substitute that with Puresense orange soap now and can enjoy healthy skin. This soap bar lasted around one week and didn't melt unexpectedly quick. So I can make out that the full-size soap bar won't finish as early as one month or so. 6. Suitable for all skin types. 9. No Animal derived ingredients. 10. Goodness of Olive oil. Actually Nothing. But may need to apply body lotion during extreme weather conditions. You may place your order directly from Pusesense's official website or can choose to buy it from other online shopping portal like Nykaa.. 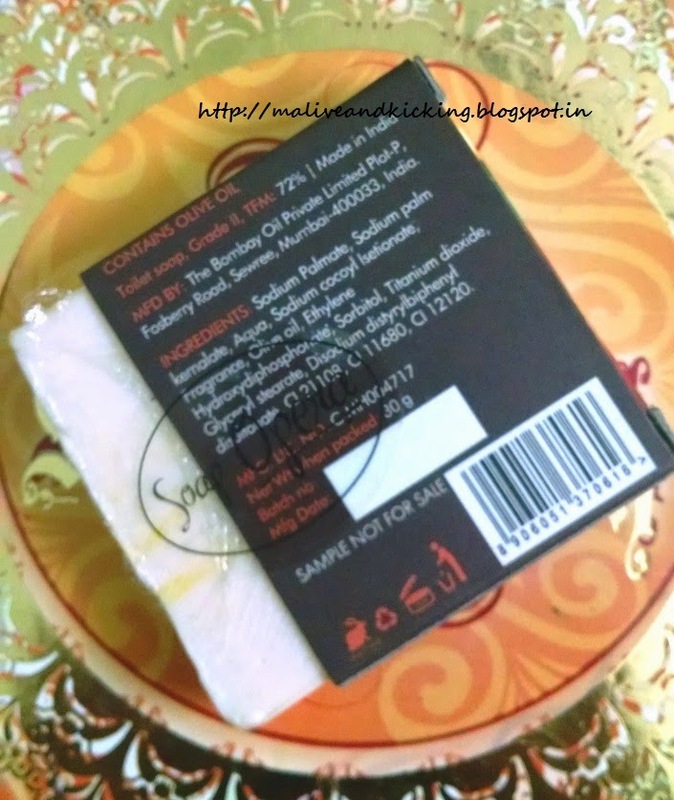 The soaps looks pretty and your review is helpful to know more about this soap.